Please add references to books and survey articles here. 1. R.G. 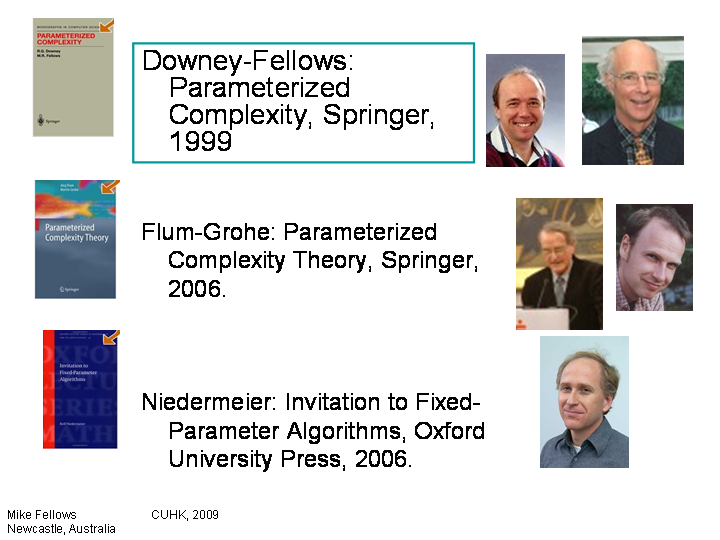 Downey, M. R. Fellows: Parameterized Complexity Springer-Verlag, 1999. 4. Marek Cygan, Fedor V. Fomin, Lukasz Kowalik, Daniel Lokshtanov, Dániel Marx, Marcin Pilipczuk, Michal Pilipczuk, Saket Saurabh. Parameterized Algorithms. Springer-Verlag, 2015. 5. M. R. Fellows and F. A. Rosamond. Parameterized Complexity Extremal Theory. Cambridge University Press. In progress. 6. H. Fernau. Parameterized Algorithmics: A Graph-Theoretic Approach. Habilitationsschrift, Wilhelm-Schickard Institut f ur Informatik, Universitat Tubingen, 2005. Book in progress. The Computer Journal Vol 1 and Vol 3, 2008. Special Eds. Michael Fellows, Rod Downey and Michael Langston. This two-volume special issue has over 17 survey papers on various areas of Parameterized Complexity, book reviews, and a visionary preface by Mike Fellows.